The Historical Chocolate Company is pleased to announce the introduction of its first Georgia chocolates based on Savannah’s Juliette Gordon Low Birthplace. 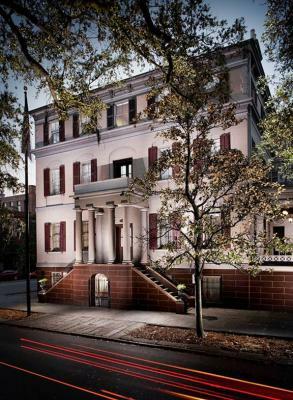 Constructed between 1818 and 1821 for Savannah Mayor James Moore Wayne, the house was purchased by the Gordon family in 1831. On October 31, 1860, Juliette Gordon was born here and was given the nickname “Daisy” by family. In 1886 Daisy married William Low, the son of a wealthy businessman, and moved to England. After her husband’s death, Daisy met Sir Robert Baden-Powell, the founder of the Boy Scouts, who introduced her to the Girl Guides. On March 12, 1912, Daisy founded the American Girl Guides in her hometown of Savannah. 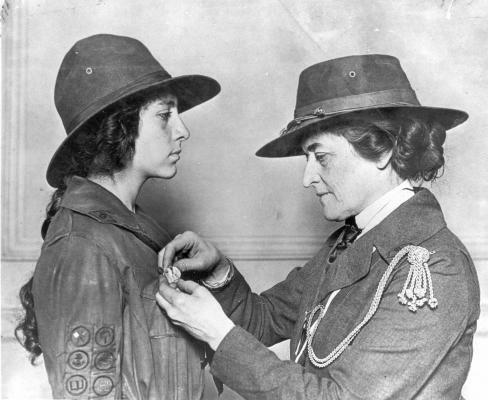 By 1913 the movement’s name changed to the Girl Scouts. Juliette Low died in 1927 of breast cancer leaving behind a growing organization with more than 167,000 members. Her home was saved from demolition and purchased by the Girl Scouts USA in 1953 to serve as a museum, a memorial to Daisy and a program center for Girl Scouts. Learn more about the Juliette Gordon Low Birthplace by visiting their web page. You can order your Juliette Gordon Low Birthplace chocolates on our web page! Bella, a brown and white Dutch mix rabbit, spends her days hiding under furniture, sneaking into the kitchen, and being scratched between the ears by her owner Barbara Post. Nine years ago, however, she was alone and abandoned in a cage at a shelter with an uncertain future. Originally purchased by a family as an Easter bunny, they soon grew tired of caring for her and gave her up for adoption. At the time, Barbara was looking for a companion for her first rabbit, a purebred Mini Rex named Fox. The House Rabbit Society introduced Fox to a variety of rabbits to help find him the perfect fit. “Fox was very aloof,” Barbara said. “Girl rabbits would come up to him and he would not even pay attention. And then we put Bella in with him and they immediately started playing and running around. You could tell right away that they were going to be a good fit. So I adopted her.” Thanks to the efforts of the House Rabbit Society, Bella now enjoys a carefree life with a loving family, but not all rabbits are so lucky. Are you ready for a roommate? Rabbits are social animals that are best kept indoors. Outside, rabbits are susceptible to extreme temperatures, fleas and disease. Are you okay losing your cable television connection? Some bunnies love to chew on rugs, furniture and electrical cords, which may need protection as if you were child-proofing your home. Do you mind cleaning up a few accidents? Rabbits can be trained to use litter boxes, but they may have an occasional accident. Are you ready for a grooming session? Bunnies groom themselves constantly, but they can benefit from being brushed regularly. Can you watch their diet? Rabbits need a diet of good quality pellets, fresh hay, fruits and vegetables, and plenty of clean water. They cannot live on carrots alone. In fact, because of the high sugar content, carrots should only be a treat. Can you make a commitment? The average spayed or neutered rabbit lives as long as a cat or dog. According to the Guinness Book of World Records, the oldest rabbit in the world lived to the age of 18. Are you ready for two? Rabbits are social creatures, and many do well with a companion. Are you okay with allergies? Allergies to pet hair are common, as are allergies to hay, which rabbits should always have available to them for healthy digestion. Adopting a rabbit on the cute factor is not responsible,” said Barbara. “There is a lot to know about a rabbit, and it is a commitment.”In addition to being the owner of a rescued Easter bunny, Barbara owns the Historical Chocolate Company. 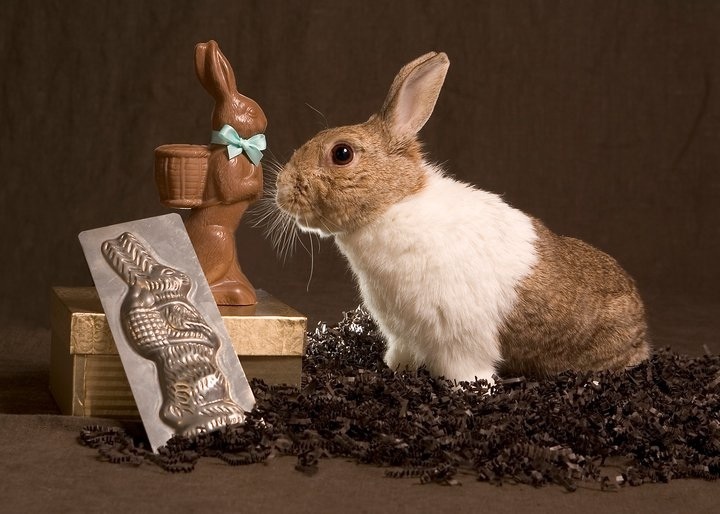 This year, she is combining her love of rabbits with her chocolate business and will be offering chocolate Easter rabbits patterned from antique chocolate molds. 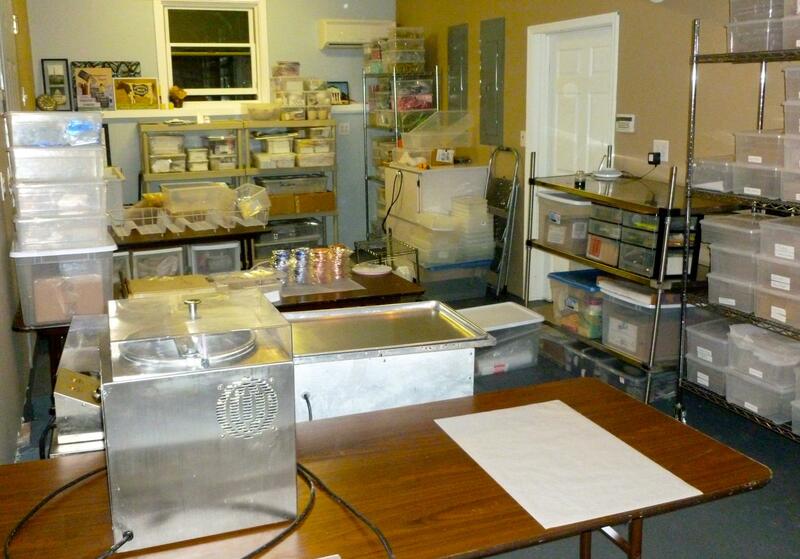 The Historical Chocolate Company will be donating a portion of the proceeds to the Make Mine Chocolate! campaign and the House Rabbit Society’s Maryland, D.C. and Northern Virginia chapter so that rabbits like Bella find a home. One in five couples get engaged in December, according to Fast Company. This means thousands of couples are about to start the wedding planning process in January. The average wedding costs nearly $30,000 and with almost a third of couples paying for their weddings themselves, keeping costs down is important, especially in these tough economic times. One budget item that newly engaged couples can find creative ways to save money on is wedding favors as finding a perfect wedding favor doesn’t have to be hard or expensive. With the price of the average wedding favor between $2 and $8 and the typical guest list totaling nearly 160 people, costs can add up quickly. Think location. Use favors as a way to share the character of the wedding locale. Wedding venues themselves can provide inspiration, or a visit to a local souvenir shop. Many of our customers pick our favors because they match their ceremony or reception location, but others choose sentimental reasons like it reflects where they met or where they got engaged. One couple that got married in Savannahused Lincoln Memorial chocolates for favors because that’s where the groom proposed. Look at guest list. Choose something you know the guests would enjoy. Make favor giving like gift giving so that your favors won’t be left behind or go unused. Err on edible. People love food. Make the memory of your wedding cake linger by sending guests home with an edible treat. “Edible favors are great because if you as a guest don’t like the favor, there is bound to be someone at the wedding who will gladly take it and it won’t go to waste,” says Terri Eaves of Bash LLC, a Washington, D.C. area wedding planner. Double up. Incorporate favors into a centerpiece. 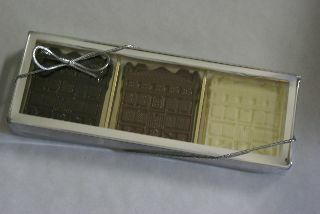 Pile chocolates or candies in square glass vases. Make it travel friendly. Guests will appreciate being able to stash their gift in a purse or pocket on their way out of the reception. Keep it small and beautifully wrapped. Go simple. Instead of splurging for a costly item, spruce up the presentation of a simple item. Nix printing costs. Skip custom engraved boxes and other printing costs by decorating with a sticker or a simple tag attached by a ribbon that matches your wedding colors. DIY. Ask your friends and family to help put on the finishing touches. While we are happy to customize our chocolates in cute personalized boxes, ribbons in your wedding colors, or customized labels or tags, brides can use our chocolates in a ‘do it yourself’ project with their bridesmaids to customize their favors those personal touches. By following these simple tips, couples planning their “big day” can save money while still adding a fun and elegant way to thank their guests for being a part of it. In the 18th century, holiday decorations were more reserved than they are today. Period illustrations depict simple embellishments of evergreens, holly, mistletoe, and berries made into swags and wreaths to mark the holiday season. One such example can be found in an engraving published about 1775 by London print sellers Bowles & Carver entitled Settling the Affairs of the Nation, in which evergreen cuttings are set in the windowpanes, small wreaths decorate the door, and greens hang from the ceiling in a tavern scene. So we thought it would be fitting to decorate our chocolate historic homes in a similar fashion by offering our customers the option of adding holiday cheer in the form of a wreath to their orders! In the spirit of the holidays, we are offering this free of charge, simply request the wreaths when placing your order. Also be sure to visit our Facebook page and follow us on Twitter, where we will fill the holiday season with historical facts and trivia about the traditions of the past and celebrations at historic sites around the country. The Historical Chocolate Company is pleased to announce that we are expanding into the Lowcountry, with the addition of Charleston SC’s Middleton Place to our collection. Middleton Place was established early in the life of the Carolina colony and served as a base of operations for a great Low Country planter family and was home to a dynamic African-American slave community. Begun in 1741 by Henry Middleton, President of the First Continental Congress, the 60-acre landscaped garden was both an intellectual and emotional focus for successive generations of Middletons. Until 1865, the garden was nurtured and embellished by Henry’s son, Arthur Middleton, a signer of the Declaration of Independence; Arthur Middleton’s son, Henry Middleton, who was Governor of South Carolina and U.S. Minister to Russia; and Governor Henry Middleton’s son, Williams Middleton, who signed the Ordinance of Secession. Despite long absences prompted by education abroad, military service, and public and diplomatic careers, Middleton family members have always returned to this Ashley River plantation. The development and prosperity of the Gardens changed drastically during Williams Middleton’s ownership. In signing the Ordinance of Secession, he endorsed the last Confederate cause; a failed attempt at independence that eventually led to the destruction of Middleton Place. On February 22, 1865, a detachment of the 56th New York Volunteer Regiment burned and looted the house and gardens. All that remained was the south dependency building, which is today the Middleton Place House Museum. Two decades after the Civil War, during the great Charleston earthquake of 1886, Middleton Place was dealt yet another destructive blow. The Garden’s terraces were ripped open and the water in the Butterfly Lakes was sucked dry, reshaping in just minutes what had taken scores of slaves a decade to build. The Civil War and the great earthquake of 1886 had taken its toll, and Middleton Place Gardens lay overgrown and neglected until inherited by J.J. Pringle Smith in 1916. He soon began the massive project of restoring the Gardens to their original splendor of the mid-eighteenth century. The restoration of these elegant and beautiful Gardens gained national attention, and on the occasion of the Garden’s bicentennial anniversary in 1941, The Garden Club of America awarded the Bulkley Medal to Middleton Place “in commemoration of Two Hundred Years of enduring Beauty.” Fifty years later, the International Committee on Monuments and Sites (ICOMOS) has heightened that distinction, naming Middleton Place one of six U.S. gardens of international importance. In 1974, J.J. Pringle Smith’s heirs established the non-profit Middleton Place Foundation, which now owns the Middleton Place National Historic Landmark. Today, Middleton Place is a thriving restoration or eighteenth and nineteenth century plantation life. Having survived wars, earthquakes, and hurricanes, including Hurricane Hugo in September of 1989, Middleton Place remains a resilient masterpiece of landscape design and a well-preserved plantation that demonstrates two centuries of plantation life.